American Ninja Warrior returned to Oklahoma City for the second time recently. Once more, the course was built almost on the steps of the State Capitol Building. 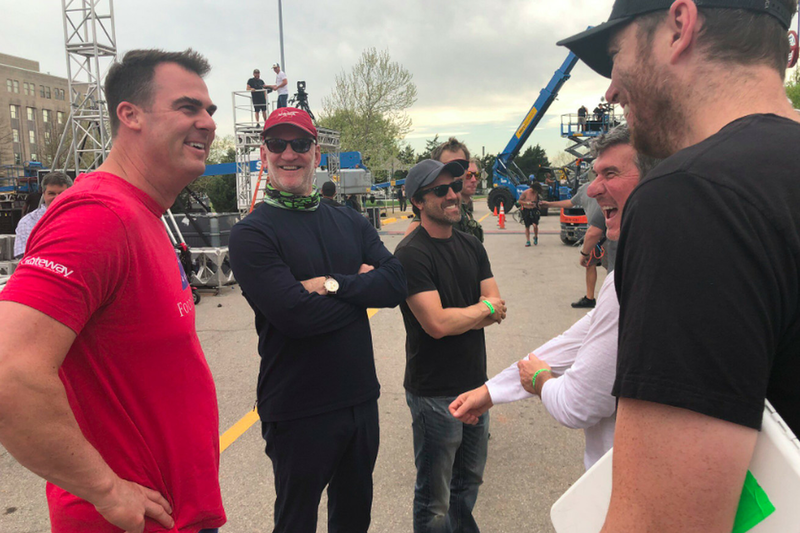 With it THAT close to his offices, Oklahoma Governor Kevin Stitt apparently couldn’t resist the call of the challenge. According to posts on his Twitter account, the Governor gave the course a shot. His post says he can’t share the video of it until the episode airs later this summer, but there are a couple of hints as to how he did. Yup, the Governor earned a battle wound during his Ninja Warrior attempt. There’s even photographic evidence. Of course we’re not going to tell you that. But hey, that means he didn’t go down on the first obstacle! We’re also not going to point out that if you study his pictures, you might get some vague hints at the obstacles. Nope. We’re not going to say that. We’re better than that. It was great to see that Oklahoma City wholly embraced Ninja Warrior’s return. The weather might not have turned out for the best, but the people were happy to see the crew and cheer on the competitors!